There is a viciousness lurking within the 2017 Mercedes-AMG GT C, a ferocity to the way it accelerates that sets it apart from its lesser, suffix-free GT sibling. Both have a 4.0-liter, handcrafted turbocharged V8 engine, but the differences in power and character are palpable. One car is fast; the other, well, vicious. The thing is, and perhaps this is quite literally the beauty of the GT C, that it doesn’t look particularly vicious. Certainly not as the GT C Roadster slathered in $9,900 designo Solarbeam Yellow paint. It’s a pretty car that’s lustworthy enough to earn buckets of buyers based on its looks alone, but like Alicia Vikander in Ex Machina, there’s a tremendous machine disguised by all that hotness. Hotness that is maintained despite a few functional tweaks made to enhance its aerodynamics and handling prowess relative the GT and the coupe-only GT S that resides in the lineup between them. The most obvious differences are at the rear, where a horizontal vent slices under the trunk lid, expelling air that’s been shunted up from below to enhance the downforce already created by the roadster’s speed-activated pop-up spoiler. Additional vertical vents just aft of the widened fenders – 2.25 inches more than the GT and GT S – serve as aerodynamic elements and visual endowments to make the tail end look a tad more bootylicious. The accompanying soundtrack is sweetly mechanical and addicting, encouraging you to downshift early and often to let it sing to its handcrafted heart’s content. 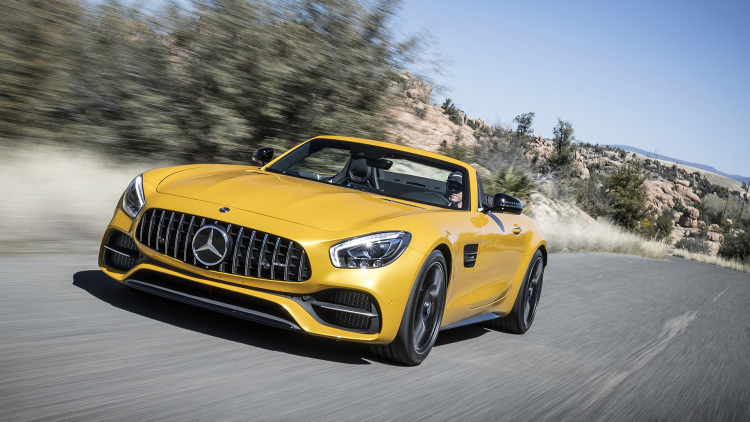 Rocketing forth in the opposite direction up the gearbox brings in the talents of the standard AMG Performance Exhaust, complete with loud and extra-loud modes. Its song is spot-on, being just enthusiastic enough to make your toes tingle but not so obnoxious to draw complaints from the HOA. The snaps, crackles, and pops it produces when off throttle are also of the more subtle, natural variety than the rather contrived, farty efforts found in an increasing number of cars. In addition to the extra power, the GT C’s otherwise shared seven-speed dual-clutch automated manual transmission gets revised gearing – first gear has a higher ratio, seventh has a lower one. As always, this transmission is a gem when in Sport+ or the Race mode exclusive to the C and R. It expertly knows when it’s appropriate to downshift when braking hard into a corner, and as a result you end up using the paddle shifters because it’s fun, not because it’s necessary. Meanwhile, the transmission’s behavior in Comfort mode is just as buttery smooth as that of a traditional automatic. Now, all of the above applies to both GT body styles, but this is the first time we’ve had a chance to sample the new-for-2017 Roadster. Its decapitation results in an extra 55 pounds of structural enhancements along with a folding cloth top that neatly stows away in 11 seconds at speeds of up to 33 mph. When raised, the top does an excellent job of keeping wind noise out, while noise and buffeting are acceptable when lowered. The glare-resistant COMAND screen and available seat ventilation should be appreciated when the sun is doing its damndest, while the Airscarf neck heaters will be handy during tweed-cap-and-scarf season. Whether the top is raised or lowered, however, the GT lives up to its grand touring name. There is more interior space than in the old SLS or the Jaguar F-Type, a sports car that’s perhaps closest to the GT in overall concept, if not execution. Though verging on rock hard, the AMG Performance sport seats, complete with adjustable side and bottom bolsters, never stopped being supportive despite more than 300 miles of driving and a driver with a questionable back. There’s even a useful pair of cupholders, a half-decent glovebox, and a trunk capable of stowing a pair of sizable weekend bags. Hell, even the driving aids are the usual superlative Mercedes norm, meaning you don’t really need to drive much at all once on the highway. As such, forget the highway. Arriving in dealers this fall, the GT C is truly one of today’s special cars, possessing the increasingly rare combination of genuine automotive beauty and world-class, occasionally vicious performance. You’ll want to drive it, you’ll want to ogle it, you’ll want to hear it.